A question from a patron led me to look through the iconography collection for the first time. It’s six boxes full of loose prints and photographs of Johnsonian interest, and I suspect I’ll find lots of interesting things to post here. These beer labels caught my eye right away. 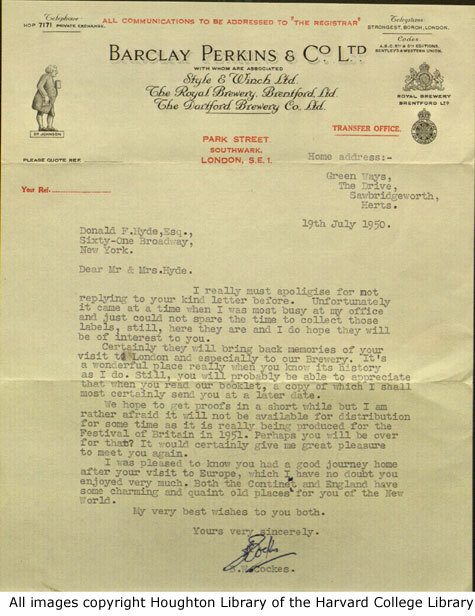 After Henry Thrale’s death in 1781, Samuel Johnson (as executor of Henry’s will) and Hester Thrale sold his Anchor Brewery to the newly formed Barclay Perkins & Co., who would operate it until their 1955 merger with Courage Ltd., later Scottish & Newcastle. 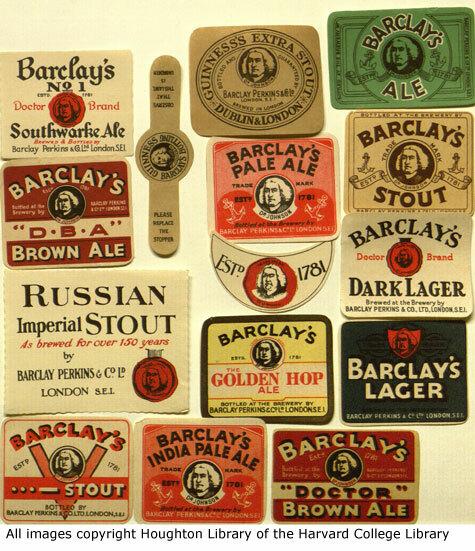 On a visit to England in 1950, the Hydes visited the Anchor Brewery, and later obtained these Barclay Perkins beer labels which pay tribute to the brewery’s connection with Samuel Johnson.